Potato salad is a summer classic—but it’s also a spring and fall and winter classic. Some like it moist and creamy. Some like it dry and crumbly. Some like it dressed in egg-rich mayonnaise. Some like it dressed in oil and vinegar. Some like it with sweet relish and a dash of sugar. Some like it sour with dill pickles and green olives. There are many ways to make potato salad but always it can be flavorful and reflect the season. Step One: Cook potatoes. Scrub the potatoes well. Bring a medium pot or a large kettle of water to a boil over medium-high heat. Use enough water to cover the potatoes by 1 inch. Add a dash or two of coarse salt. Cook the potatoes whole or cut in their skins, or peel them if you like. Bring the boil down to a simmer then cook until the potatoes are nearly tender but still firm in the center–there should be little or no resistance when poked with a small sharp knife, about 10 to 15 minutes. Stir once or twice for even cooking. Avoid overcooking the potatoes. Step Two: Prepare marinade. While the potatoes are cooking prepare a marinade. See suggestions of several oil and vinegar marinades below. Step Three: Cut potatoes. Once the potatoes are cooked tender, drain them in a colander. Leave them in the colander or spread them out on a sheet pan until cool enough to handle. Then cut them into cubes, slices, or bite-size pieces and place them in a work bowl. Use a serrated knife if they have skins to avoid tearing the skins. Step Four: Marinade potatoes. While the potatoes are still warm, drizzle the freshly made marinade over them and mix carefully until each slice is coated. Combine the potatoes carefully with the marinade until they are coated. Avoid breaking, mashing, or crushing the potato slices as you mix. Let the potatoes cool and marinade for up to two hours for best flavor. After that, place them in the refrigerator until you are ready to move on to the next step or serve. You do not have to marinade the potatoes, but marinating infuses flavor into them. It is best to marinade the potatoes while still warm; chilled potatoes will never achieve the fullness of flavor. If any of the marinade has not been absorbed by the potatoes when you are ready to move to the next step drain it off. Step Five: Add dressing and seasonal flavoring. After marinading and before serving add mayonnaise or other dressing along with seasonal vegetables and flavorings, cooked meats, fish, or seafood to the potatoes. Mix gently until evenly blended. Seasonal flavoring combinations are almost limitless—no two potato salads will ever taste the same again, but they will all be imaginative and flavorful. Potatoes for potato salad: Waxy potatoes with high moisture, high sugar, and low starch content are firm and hold their shape after cooking much more so than low moisture, starchy potatoes do. Waxy potatoes include small and large red-, white-, and yellow-skinned potatoes, and purple- and blue-skinned potatoes. Red Bliss, Peruvian blues, Yellow Finn, Yukon Gold, red creamers, and German fingerlings are waxy potato varieties well-suited for potato salad. Russet potatoes are starchy and mealier than waxy potatoes, but some potato salad lovers prefer them because they make a creamier potato salad. Cook potatoes—boiling is most common–whole, halved, or diced without peeling as long as the skins on the potatoes look fresh. Cook until they are just tender when pierced with a sharp knife. If you peel potatoes before cooking, steam them in a vegetable steamer until they are tender but still firm. If you boil peeled potatoes, be careful not to overcook them to mush. If you plan to leave the skins on the potatoes when serving—colorful if the skins are red, purple, or blue–use a serrated knife to cube or dice them so as not to tear the skins. How many potatoes: One and a half pounds of potatoes will make 4 servings of potato salad. Three pounds of potatoes will make 6 to 8 servings. About three medium potatoes make a pound. Eight to ten small new potatoes make a pound. Marinating potatoes just as they have slightly cooled after cooking will make for the most flavorful potato salad. The potatoes should be sliced or diced or cut into cubes or bite-sized pieces and placed in a large bowl then dressed with the marinade; vinegar or oil and vinegar marinades are very well suited for potato salad. Basic vinaigrette: Crush 1 clove minced garlic, add ½ teaspoon kosher salt and ½ teaspoon pepper, add tablespoon freshly squeezed lemon juice, add 2 tablespoons red wine vinegar, and whisk in ⅓ to ½ cup olive oil. Simple vinaigrette: Whisk ¼ cup extra-virgin olive oil, 1½ tablespoons white wine vinegar, salt and pepper in a large bowl. Mustard vinaigrette: Whisk ¼ cup Dijon mustard, ¼ cup grainy mustard, ½ cup olive oil, 1 tablespoon balsamic, sherry or other flavorful vinegar; 3 tablespoons chopped fresh basil leaves or parsley. Apple cider vinaigrette: Whisk ⅓ cup apple cider vinegar, 2 teaspoons sugar, 1½ teaspoons dry mustard, salt and pepper. Bacon vinaigrette: Whisk 2 teaspoons of bacon drippings with 1 teaspoon of olive oil, ¼ cup of chicken stock, 3 tablespoons white wine vinegar, 1 teaspoons whole-grain Dijon mustard, and salt and black pepper to taste. Chicken stock vinaigrette: Combine 1½ cup chicken stock and 6 tablespoons of red wine vinegar and season to taste with extra-virgin olive oil, kosher salt, and black pepper. Herb and scallion vinaigrette: Whisk together ¼ cup olive oil, chopped fresh-picked herbs and chopped scallions. Add dressing to coat the potatoes evenly; add more to make the salad creamy. Mayonnaise (add until the mixture is as creamy as you like) tossed with chopped flat-leaf parsley and chopped onion and season with salt and pepper to taste. Fat-free mayonnaise mixed with a bit of curry and honey for flavor, color, and sweetness. Plain nonfat yogurt mixed with Dijon mustard. Mayonnaise mixed with Worcestershire sauce and Dijon mustard and salt and pepper to taste. Pesto and mayonnaise stirred until well combined. Dressing with vinaigrette only: When the potatoes are tender, put them in a medium bowl, drizzle with half the vinaigrette and toss very gently. Let rest for at least 30 minutes so that the potatoes can absorb the dressing. To finish the salad, toss the potatoes with the remaining vinaigrette, salt and pepper to taste, and garnish with chopped parsley and chives. Fold and mix gently seasonal flavoring into potato salad for even more flavor. Do this when you are mixing in the dressing. Choose and mix seasonal flavorings to taste. As a guide, the ratio of one-third as much seasonal vegetable or other solid flavoring or combination of seasonal flavorings to potatoes is helpful: for example, to three cups of potatoes add one-cup of sliced celery or the combination of chopped celery and chopped celery leaves; sprinkle in additionally chopped onion and chopped mint leaves to taste. • Combine 1½ cup white beef stock and 6 tablespoons of red wine vinegar and season to taste with 1 or 2 tablespoons of bacon fat and kosher salt, black pepper, mustard, and sugar to taste. Pour the hot dressing over the warm potato slices and serve immediately or cover and refrigerate for up to 1 day. • Peel, cut, and place potatoes in a large work bowl. Sauté 4 or 6 pieces of bacon cut into small pieces; spoon off all but 2 tablespoons bacon fat from skillet. Sauté additional aromatic vegetables such as onions or garlic. Stir in 1 teaspoon of all-purpose flour, 2 teaspoons sugar and salt and pepper to taste and blend. Stir in 3 tablespoons red wine vinegar and ½ cup of water and stir until it slightly thickens and is boiling. Gently drizzle and stir this hot dressing over the potatoes. 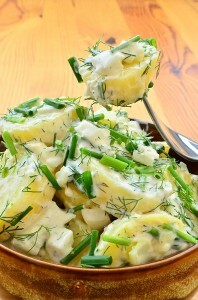 Rather than combining potatoes with dressing, arrange the potatoes on a platter or in a shallow bowl; slice hard-cooked eggs and intersperse or layer them with the potatoes; ladle the dressing over all and garnish with fresh chopped celery, scallions, or dill or other fresh chopped herb.